Chelsea vs. Liverpool : 27 January 2015. In the middle of our lengthy and, so far successful, league campaign came a hiatus of eight days in which Chelsea Football Club were set to play three cup games. Some European leagues shut down for a winter break at this time of the year; we just got down and dirty with games against Liverpool and Bradford City in our two domestic cup competitions. The game at Anfield was a strange one for me. I set off a little later than planned, but just after catching wind of a large traffic snarl-up on the M6. There was also a looming threat of snow in the north-west. I was forced to divert, south of Birmingham, and take some minor roads through Kidderminster, Bridgenorth and Telford. We experienced some snowfall, and at just after 5pm, still miles from the M6, I decided to head home. Parky and I re-traced our steps and ended up watching the semi-final first leg in a pub in Tewkesbury, surrounded by squealing Liverpool supporters. My friend Tim, who is from the same neck of the woods and had set off thirty minutes before me and who advised on the detour, missed the kick-off. It is likely that we would have missed the entire first-half had we decided to plough on. It would be the first game in over forty years that I have missed in such circumstances. Games have been postponed once I have set off– I can think of four or five – but this is the first one in over one thousand where I was forced to return back with a ticket in my pocket. Well, apart from one occasion – another Anfield game, this time in 2002 – when car trouble caused me to head home after just a few miles. On that occasion, I have to give full credit to Liverpool Football Club, who were more than helpful in allowing a mate of mine to attend in my place using a faxed copy of my match ticket. After the Bradford City game, maybe I would have preferred to have missed that one, too. All of this came after our barnstorming win in the league at Swansea when we annihilated our opponents in a footballing masterclass. January 2015 was turning into a soap opera all of its own for Chelsea. After the Bradford City defeat – yes, it seems strange typing these words – it was like being back at school in the early ‘eighties, when school friends would habitually seek me out after yet another demoralising defeat against Wigan, Watford, Rotherham or Shrewsbury. At work on Monday, for once everyone wanted to talk to me about football. I wondered where they had been since August. To be honest, there was something quite liberating about the whole experience. It enabled me to put things into perspective and – vitally – it helped me appreciate the game against Liverpool even more. This was going to be – I was absolutely bloody sure of it – a night to remember. I was just so happy that we only had to wait a few days for the manager, players and supporters to form one unbreakable unit against the visiting hordes from Merseyside. This, I hoped, would be a night for the ages. I was convinced that the Chelsea support would want to show our love for the team by cheering the team on to another Wembley final. I wasn’t sure how Jose Mourinho’s recent bombast which ridiculed the Chelsea support would affect the noise levels. I just hoped that the manager’s game plan for the rest of the season would show better focus and reasoning than the frankly embarrassing outbursts in which he ridiculed us. If the noise levels against Liverpool proved to reach the predicted high levels, I was not sure that Jose Mourinho should get any credit. The team would need our support regardless of our manager’s recent comments. PD had collected LP en route to Chippenham and they picked me up at just after 3.30pm. As we pulled out of the pub car park, “The Story Of The Blues” by The Mighty Wah! was playing on PD’s CD player. We drove up to London as night fell. The illuminated signs above the M4 guided us in. We reached the pub at around 6pm. Time for a couple of pints and a few laughs. On the walk to Stamford Bridge, I stopped to take a few photographs of the bustling crowds heading in to the stadium. Blurred bodies in dark coats rushed by. I spotted a grafter selling red and blue half-and-half scarves and snapped. As others rushed past, he looked straight at my camera. The expression on his face suggested a variety of emotions. I was inside a darkened Stamford Bridge with a few minutes to spare. The main floodlights were dimmed, leaving just the perimeter lights and those on the balcony walls to produce any illumination. Blur’s “Park Life” was played. The lights stayed dimmed. There was an ethereal quality to the scene in front of me. I took my camera and trotted to the rear of the MHU and took a few panoramic shots as the two teams entered the vibrant green of the arena. Gradually the main floodlights grew stronger. The crowd was invigorated and roared. As I re-joined Alan and PD, I soon realised that The Shed looked different. The 4,100 away fans were housed in the entire lower tier, as I expected, but were also occupying the west half of the upper rather than the east. There were around two thousand Chelsea fans, including the displaced Parky, in the area usually occupied by away fans. It looked odd. There were a few Liverpool flags draped over the balcony wall. Courtois –Luis, JT, Zouma, Ivanovic – Matic, Cesc – Hazard, Oscar, Willian – Diego Costa. From the very first kick of the ball, the home support was involved. It was beautiful. My prediction about the noise levels was proved correct. We rose to the challenge. The tickets were only £25 and I got the distinct impression that there were more “proper” fans in attendance than usual for a midweek game. It was stirring stuff. Of course, there were the usual barbed songs and anthems throughout the night, plus a couple of new ones. If I am truthful, I think that Liverpool slightly edged the first forty-five minutes. The opening portion of the game was so tight, with possession split evenly. I was unsighted for the foul by Skrtel on a twisting and turning Diego Costa. Then two good Liverpool chances; a searching ball by Gerrard found the raiding Moreno, but Thibaut saved, then our defence opened-up for the impressive Coutinho to race through, but our ‘keeper pulled off an even better save. This was already a fine match. And the home crowd roared on. A couple of late chances fell to Oscar, but he misfired. Fabregas was playing deep, and hardly in the game. Willian was infuriating everyone with his tendency to continually cut inside, rather than sweep past his marker or pass to the advanced Ivanovic. Tensions always tend to be heightened during our recent tussles with Liverpool and there was an underlying sense of antagonism as the half developed. This was akin to our battles with another northern team, some forty years on. Liverpool as the new Leeds, anyone? At the break, no goals. Fabregas, injured, was replaced by Ramires. The challenges kept crashing in. An altercation involving Skrtel and Costa again took place down below me though I was again unsure of the detail. Referee Oliver was surrounded by players and the noise continued. We began to turn the screw. Our talisman Hazard enjoyed a devastating run deep in to the Liverpool defence, twisting and turning, before unleashing a shot which screamed past Mignolet’s left post. Chances for both teams, the pace relentless, the noise thunderous. Then, sudden drama. 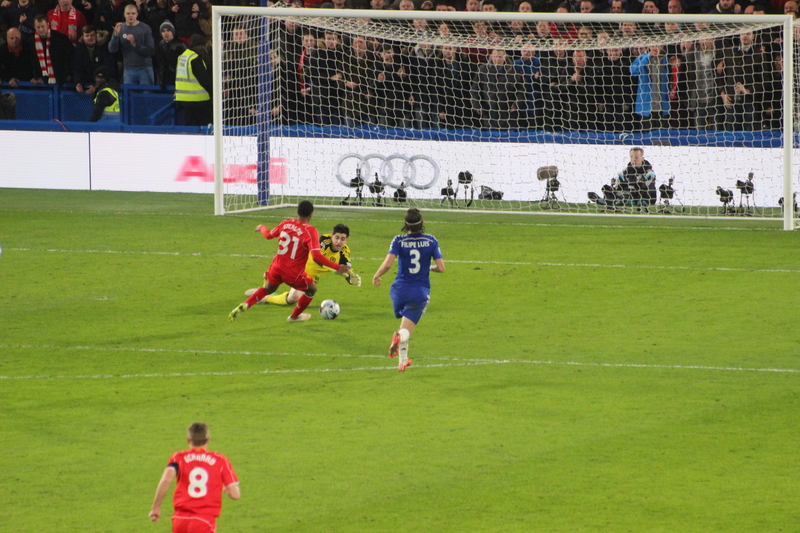 The ball was slotted through, slightly ahead of Sterling, and Courtois was able to rush from his goal and save. Filipe Luis, playing well, was injured and replaced by Cesar Azpilicueta. A few chances to both sides did not bother either goalkeeper. With away goals only counting after extra-time, the 1-1 result from Anfield meant that there would be extra time. The two squads regrouped underneath the towering East Stand. At times it looked like we were tiring. Eden Hazard, full of running, seemed to be totally exhausted one minute, only to embark on yet another spirited run at the Liverpool defenders the next. His spirit was magnificent. The bookings had stacked up throughout the game and we were howling when Lucas – one of those booked – was allowed to remain on the pitch after a rash foul on Hazard. Willian took the resulting free-kick, in front of the away supporters, whose noise had dwindled as the night progressed, Jose please note. The ball was sent in to the six yard box with pace and precision. Amazingly unmarked, Ivanovic rose and planted the ball into the Liverpool net. The Bridge, no doubt nervous at times despite the noise, roared as one. Advantage – even more so – to us. The noise enveloped Stamford Bridge further; it had to be one of the best atmospheres at Chelsea for ages. There was still an air of tension, though; a Liverpool goal would almost certainly mean penalties. Nobody wanted that. Thankfully, despite yet more antagonism between players, and more bookings, Chelsea were able to dampen Liverpool’s scarce efforts on goal. There was, thankfully, just one minute of added time on top of the 120 minutes. The referee’s whistle was met by a punch to the sky from me. This entry was posted in Season 2014-2015 and tagged 2001-2002, 2014-2015, League Cup, Liverpool by Chris Axon. Bookmark the permalink. Seeing these matches through your eyes is always a pleasure, but this one especially so. Well done. Couldn’t make this one but what a game. I don’t like watching these games on TV. I get far too nervous. It’s not like being there at the ground where you feel you can make a difference by getting behind the team. And what an atmosphere it was. I was relieved the crowd got behind Chelsea and created the noise to make it sound as though it means something. We need more of the same on Sunday. I know that some found Jose’s previous comments on the atmosphere not to their liking but I for one welcomed it. He is developing a wonderful team which has the potential to become the best we have ever seen at the Bridge. In my opinion it’s certainly the best Chelsea team I have seen in following Chelsea home and away for over 40 years. As a season ticket holder in the Mathew Harding Upper I hate sitting there with the crowd in silence apart from the away fans in the shed making it sound like their home game. It certainly did not sound like that on Tuesday and the vocal support sounded great from the TV. Hope it stays that way and we can give the players the atmosphere they deserve.